Ok, here’s the deal on this guacamole greens salad. As you can imagine, since I’m t-minus 39 days away from our wedding and smack dab in the middle of dress fittings, salads have been promoted big time. It’s par with the course. Thankfully, this hasn’t been much of a struggle, and this salad gets a lot of the credit for that. 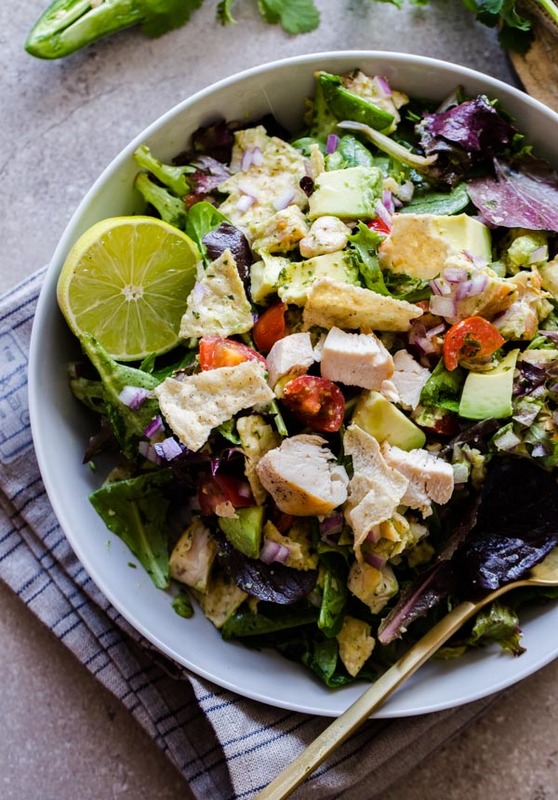 This salad is brimming with all sorts of goodies: avocado, lime juice, grape tomatoes, roast chicken, red onion, and tortilla chips. It is inspired by the Guacamole Greens salad from the once little and local to Washington, DC–and now relatively huge–salad chain known as Sweetgreen. I don’t visit often (although I have ironically went there a few times directly after wedding dress fittings), but I recently decided that I had to recreate it for the blog and share it with all of you. Or at least, attempt to recreate it. And let me tell you, with the powers of deduction and some careful analysis of my taste buds, I’m happy to report that I nailed this one. I literally cannot tell the difference between my salad and theirs–and I promise, I am not exaggerating in the slightest. I wouldn’t do that to you. That’s cruel. Obviously, the actual salad components were the easy part, the trickiest part to nail was the cilantro lime jalapeño vinaigrette. As with any good salad, the salad dressing is an integral part of the equation, so I knew this was the make-it-or-break-it element. Since salad dressings usually contain only a handful of ingredients, ratios are key. This salad’s vinaigrette is all about the cilantro and freshly squeezed lime juice. It is bright, acidic, and incredibly light. The touch of jalapeño pepper (don’t worry, it’s not spicy!) and ground cumin round it out perfectly! 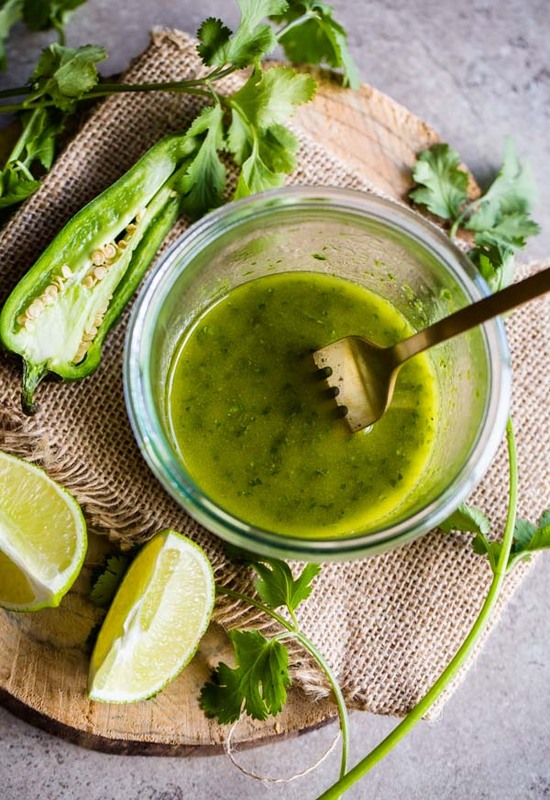 Since you want the cilantro to be relatively finely chopped in the vinaigrette (similar in consistency to a pesto), the easiest way to make this vinaigrette is in a blender or small food processor. Honestly, this salad vinaigrette could be used as an everyday salad vinaigrette for any occasion, but when tossed with these ingredients, particularly the creamy avocado chunks, it truly shines. Although I grilled chicken breasts–seasoned with just salt and pepper–on a grill pan for this salad, you could easily use a rotisserie chicken or a leftover roast chicken, and it would have even more flavor. Don’t forget to finish the salad with another squeeze of fresh lime juice! It’s the final touch. 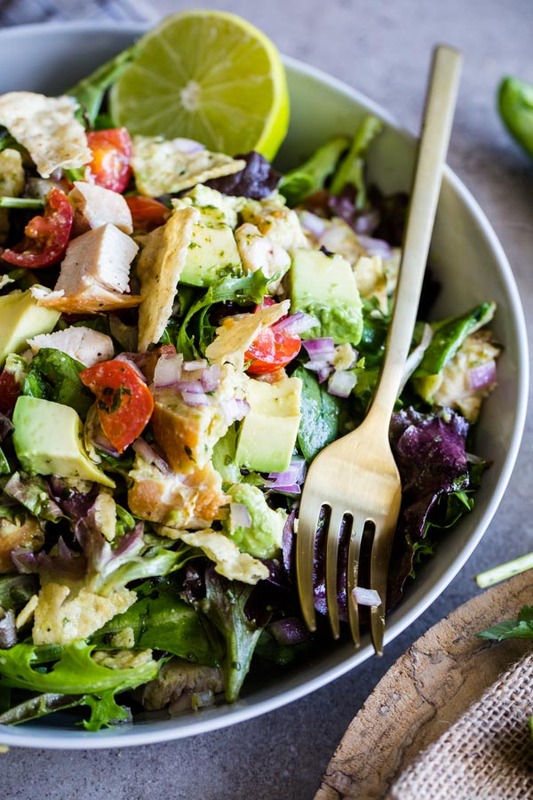 Guacamole Greens Salad with Lime Cilantro Jalapeno Vinaigrette. 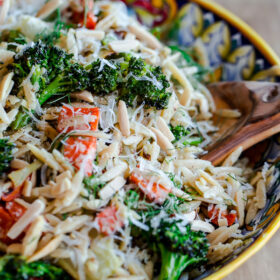 An easy, copycat recipe from the popular Sweetgreens salad chain! 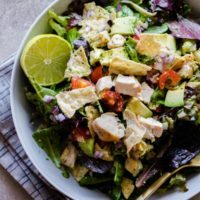 This chicken salad is easy to make, incredibly filling, and makes a great healthy main course salad! Prepare Vinaigrette: Combine all ingredients in a blender, or small food processor bowl. Puree or pulse ingredients together, until mixture just begins to come together, and cilantro is still finely chopped. Set aside in a small container. Shake before using. 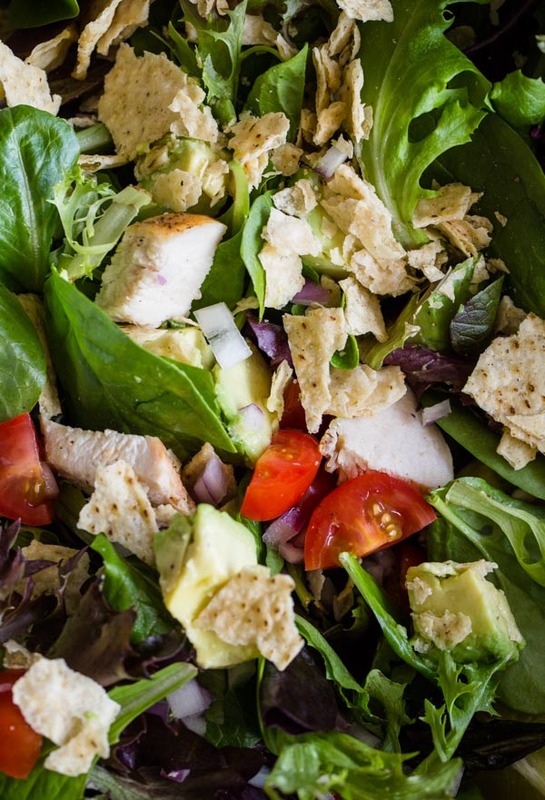 Assemble Salad: In a large bowl, place the cooked chicken, halved tomatoes, diced red onion, crushed tortilla chips, avocado, and mixed spring greens. Squeeze the wedge of lime over the salad, then toss the salad lightly with lime cilantro jalapeño vinaigrette. Serve immediately. 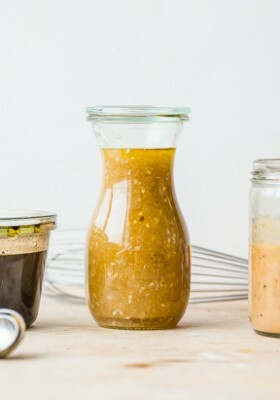 Vinaigrette can be prepared up to 2 to 3 days in advance and kept in an airtight container in the refrigerator. We have Sweetgreen in Boston and the menu sounds SO appealing to me. I haven’t been yet, but this looks like the perfect make-at-home salad. A salad has to be really good to satisfy me, too, and I think this could do it! Me too! Thanks so much Sune! I totally agree, avocado makes everything better. Didn’t realize meat had to be part of a meal for it to count as a meal. What in the world do vegetarians do? Hi Erin – please be respectful to other readers in the comment section. Thank you! I love when that happens too!! Nothing better. Be sure to let me know what you think!! I love this salad! I actually had it last night at Sweetgreen 😛 I think it’s my favorite on their menu and I can’t wait to make it at home. Haha!! Too funny. You’ll have to make it and let me know how it holds up!!! Seriously. I’m so thrilled not to have to pay $9.25 every time that I have a craving. 9.95?!?!? Just got it in NYC. It’s at least $14 here. Thanks girl!!! 🙂 Loved seeing your honeymoon pics, by the way! Oh I so agree! If I am going to have a salad as a main dish it better be loaded up! I love how many delicious elements you added to this! 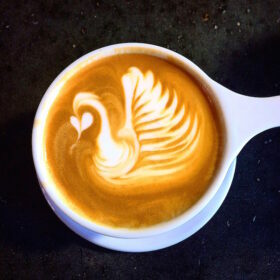 This looks so delicious Laura! Love the guacamole aspect – I’d be happy to eat this salad any day! Yum! 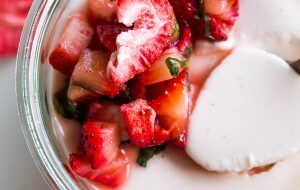 I wish I had all the ingredients for this tonight! Having turkey tacos, but this sounds better! Definitely going to make the dressing with cabbage and carrot! Loving that spice up in there!! This sounds crazy delicious! Ahhhh! That makes me so happy!! 🙂 Definitely let me know if you try it! I don’t even have a certain dress to fit into, and I would gladly down this for dinner! I pinned this salad to try soon. It looks fabulous! Excuse me while I drool on my keyboard. This salad looks so amazing – all the stuff 🙂 and that dressing!! Yum. What beautiful, bright colors! It’s definitely a little more filling than your regular salad! 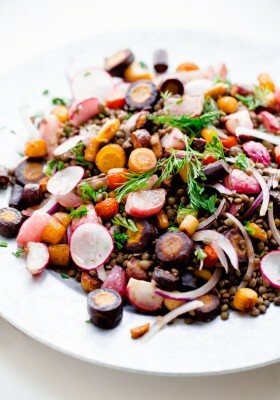 Love everything about this salad Laura! My cup of tea, esp that avocado and simplicity of those ingredients! Can never go wrong with a good mexican salad. Love the blog, and the salad. I just made the vinaigrette, and -though I love salt – found it crazy salty. I used Morton’s kosher salt… Any chance the ingredient list/amount of salt is off? Ooh. I’m really sorry–I don’t personally use Morton’s Kosher salt in my kitchen because it is almost twice as dense as other sea salts (and therefore will be substantially saltier). I should have clarified in the recipe, I apologize! Have you also tried it tossed with the whole salad, as opposed to just tasting on its own? That will make a big difference too! I will edit the recipe to let people know though. Thanks for the feedback Eily! I am always down with salads if they’re as fun as this! That dressing is KILLING ME. I need it! I have an obsession with SweetGreen, and guacamole greens is my go-to salad, You are right: you nailed this one! This was amazing!! 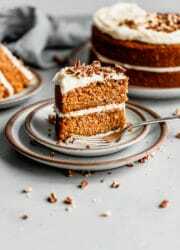 Your blog is also incredible; I can’t wait to try more recipes. Thank you! 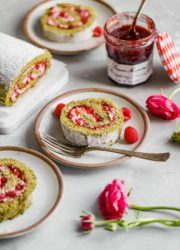 I just made this for my work team and substituted the chicken for grilled halloumi cheese – everyone absolutely loved it! For the most part, no, I don’t consider olive oil a neutral oil. 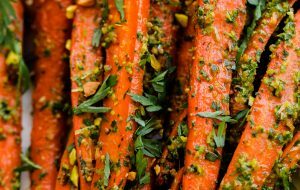 I DO make dressings with olive oil all the time, but for this recipe I prefer a more neutral flavored oil so that it pairs better with the rest of the ingredients. With that said, you can definitely prepare THIS recipe with olive oil, and you should be totally fine (especially if its an everyday olive oil)! Let me know how it turns out! Does your recipe call for 1/4 teaspoon of cumin? I noticed that you forgot to put the measurement amount. I just tried your recipe and it didn’t taste really like Sweetgreen’s Guacamole Green’s. I am wondering what step I did wrong. Maybe because I used olive oil instead of grape seeds oil? Yes! Yikes, that was a typo. I just went in to add the “teaspoon” measurement. Sorry about that! Hmmm. 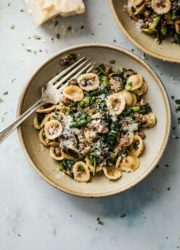 Olive oil definitely has a stronger flavor than grapeseed oil (which is very neutral and doesn’t overpower the lime/cilantro flavor as much), so that might have something to do with it, but it shouldn’t have had that dramatic of a change in flavor. I wish I could be more helpful! I’ve had the Sweetgreen’s salad on numerous occasions, and really think this recipe tastes very, very similiar (and have gotten the same feedback from other readers and family friends), but maybe every location prepares it a bit differently? Last time I failed your recipe, but I tried it again and nailed it this time. My daughter is a Sweetgreens Guacamole Green fan and she said that your recipe tastes even better than Sweetgreens. I still am not really sure what went wrong last time (Maybe because I used the wrong greens . I used the herb greens instead of spring mix) . This time I used Olive Oil and it taste great. Thank you so much for your help and your recipe! My family can now enjoy an authentic-tasting Guacamole Green meal for 1/5 of the price. OMG so Sweetgreen has been popping up all over New York City and I started getting addicted to Guacamole Greens which is easily my favorite, but it was starting to become a pricey addition. I made this over the weekend using your recipe and had got enough to make for lunch for the entire week! The dressing is SPOT on and for the first time, I am actually looking forward to a salad I personally made which never happens. And this is saving me so much too! this salad looks and sounds go amazing – I love all of the ingredients so I am sure this is going to be a winner. pinned for future dinner ideas, thank you! This dressing is da bomb! It doesn’t taste exactly like Sweetgreen’s Guacamole Greens to me, but I made the salad with romaine (that’s what I had on hand), and left out the chicken and chips. It was still very delicious though. I’m pregnant and trying to eat as healthy as possible, so I see myself making this dressing many times in my future!! Thanks again! I’m so excited to try this. I get this at sweet green at least once a week and need to stop giving them all my money! Thank you! Oh yum! This was my favorite salad when I lived in DC. I currently live in Brazil and I have been craving a Guacamole Greens salad for a while now. I am so excited to try this. Thank you for doing the leg work! Does this receive yeild one serving or two? One very large serving, or two servings! I was feeling very blue about moving out of NYC and leaving behind my precious sweetgreen (I still have the app on my phone). So happy to have stumbled on this so I can make my favorite salad! Hi Laura! Can’t begin to tell you how ecstatic I am to have found a recipe for my all time favorite dressing and salad! I was wondering…how long can I keep the dressing in the fridge for? Yay! So glad you love it too. Great question! I wouldn’t keep it in the fridge for more than a day or two tops. It will be fine, but the herbs start to lose color and it gets a bit less vibrant in flavor. Also, definitely shake it well before drizzling! 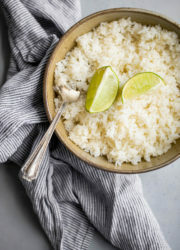 I recommend adding a splash of fresh lime juice too, because it will give it a little burst of acid. Hope this helps! Thanks for the feedback!! I lived in DC for a semester and became OBSESSED with Sweetgreen. When I returned to Texas, I called and practically begged for the ingredients to this salad dressing. You have it almost completely correct except that the very nice employee I spoke with said there is a splash of white wine vinegar in it. Either way, your version is incredibly close and delicious! YAY! I think I might have once seen that it contained that, but I didn’t feel like it would add that much of anything to the vinaigrette and would mean one more ingredient for people to have on hand. So glad you love this salad as much as I do! This recipie is actually wrong. I worked at sweet green and have all the recipie cards. You’re mssing the garlic that goes into the dressing and the porpotions on each ingrediant are off. But you’re getting close! LAURA! You nailed this recipe, thank you! I cannot tell you how happy this made my husband that we can recreate one of our favorites at home. There is so much crisp, bright flavor in in this dish! I mean, that dressing! Thank you so much for sharing your amazing skills with us! Holy moley! This was amazing!! So easy to make and sooooo freaking good. So thrilled to hear that! I lived in DC and this was the first salad I have ever eaten (I don’t like dressings) I miss it very much, but I am not a very good chef. Do you include the stem in the cilantro? Or just the leaves? What kind of oil do you suggest using? I don’t personally include the stem with the cilantro for this recipe, but I do many times for other recipes. It has great flavor, and can definitely be eaten, I just prefer the leaves for this. I would recommend avocado oil – it’s very good for you, and has a neutral flavor that won’t overpower the rest of the ingredients. I love extra virgin olive oil, but find that a stronger tasting one doesn’t pair as well with the flavors of this particular salad. Hope that helps! 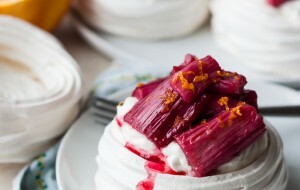 Hi Laura,Thanks for this recipe! Found your blog while googling for SweetGreen’s cilantro jalepeno lime vinaigrette. I’m addicted to their warm taco bowl and was curious to see if I could recreate. Your recipe for the vinaigrette was spot on! My mum said that the bowl tasted exactly the same! Thanks for sharing this gem. The taco bowl is somehow the only thing I enjoy eating vegetables in, so this will help me get more consistent with vegetables in my diet.